The sermon this past Sunday was part of a continuing series about friendships. In particular, we learned about going forth into the world (see yesterday’s blog) to show love to all people…especially to unbelievers. A chameleon changes its appearance to blend in with its surroundings. When we lived in Florida, I got a pretty up close and personal with lots of skin-color-changing critters! In his intense efforts to help people be saved, the early church leader Paul oftentimes changed the appearance of who he was so that others would be saved. Just as a chameleon with changed skin is still a chameleon, not a lion or a duck, Paul was still a fervent Christ-follower as he “became” like those to whom he was serving. Hmmm, so Paul ACTS? I don’t think this term means that Paul is insincere in his attempts to win over people to Christ. Actors and actresses perform best when they are able to draw on their personal experiences to pour into the character they are portraying. They find some way to relate to their character and the ones around them. I think this…essence….is what Paul is talking about. As the New Living Translation words it, Paul “finds common ground” with whoever it is he that he is serving. He finds some way to relate to those he is serving. But he is still himself. He does not abandon the faith as he rubs shoulders with the unfaithful. 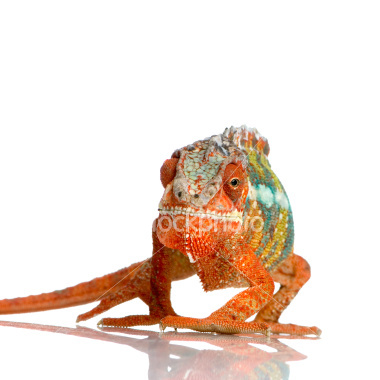 Like the chameleon, Paul may change his skin when he’s around spotted people, but he is still the same Paul on the inside. Can I do the same? What are some things I could do that would get me around other people who I could win over for Christ? I will start by making a list of things I like to do, and then I’ll prayerfully look for new places to do them. For example, I love reading. I could join one of the numerous book clubs around town. Meeting with fellow readers is one way I could befriend those who may not know Christ. Looking forward to hearing how you ginomai with unbelievers!